Over three years, St George’s Chapel Archives has been host to three trainees as part of the Skills for the Future scheme funded by the Heritage Lottery Fund and administered by The National Archives. Each trainee has spent one year at St George’s learning about work in the archives sector. They also learnt to read medieval Latin and contributed to a project to transcribe and translate the medieval account rolls of the Canon Treasurer. As the project draws to a close, our third trainee, Anastasia, reflects on what the account rolls have taught us so far about medieval life in the College of St George. There are over 350 account rolls in the Archives detailing the income and expenditure of the Dean and Canons. The earliest dates from 1363 and the latest from 1694. Collectively, they form one of the main contemporary sources about the early years of the College, as little else has survived from the first couple of centuries of the College’s existence. However, the rolls are not straightforward records to interpret. The handwriting is unfamiliar to modern eyes and the language used is not English, but heavily abbreviated medieval Latin. Although parts of some rolls had been transcribed in the 1960s, this has been the first attempt to transcribe and translate them in their entirety. The project has given us trainees the opportunity to develop knowledge of palaeography (the technical term for reading old handwriting) and medieval Latin. It has exposed some fascinating details of the income and expenditure of the College which bring its early history to life. In the 14th century the College had an income of around £600 per year. The majority of this came from its churches and rents on properties and lands. But income also came from more unusual sources. The roll for 1377-8 [SGC XV.34.14] records that £2.2s.8d. (over £1,000 today) was received for the farming of swans. This relates to a grant by Edward III to the Dean and Canons allowing them to capture all swans flying unmarked on the Thames between Oxford and London for seven years. 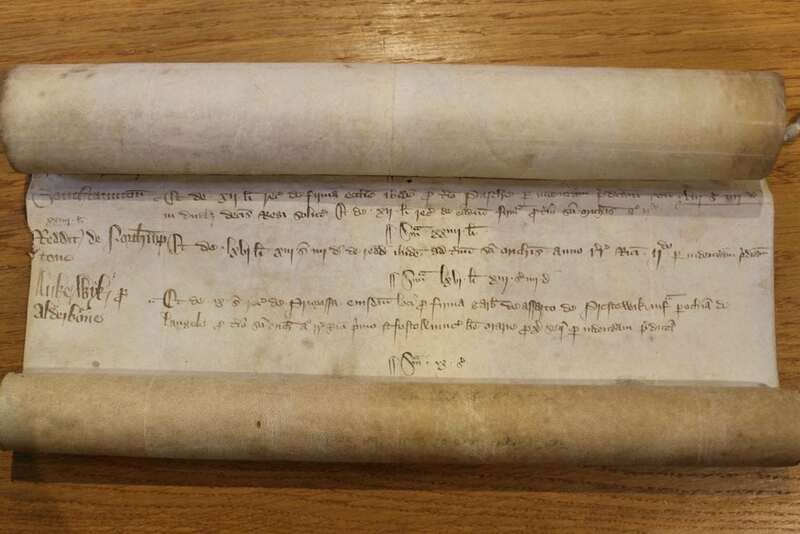 The Dean and Canons also profited by selling wine they had made to a taverner in Reading, although this industry incurs expenses too: an interesting set of entries dating from 1376 [SGC XV.34.11] relates to the construction of a wine press, and subsequent rolls detail sums spent on containers and transport for the wine. Despite the large income, the College was only just staying in the black throughout this period. The greatest expenses were the wages and stipends of the Dean, Canons, Vicars and other members of the College. In the year 1377-8 [SGC XV.34.14] the Dean was paid more than £66, amounting to 10% of the income for that year. The expenditure section also provides a glimpse into the practicalities of 14th century life. Again in 1377-8, velvet cloth was bought at 2s. per ell (approximately £65 per half metre today) for making robes for the verger. In 1376 [SGC XV.34.11], the Dean and Canons financed new buildings for the rectory in their benefice of Datchet and details of the building materials and labour are appended onto the end of the roll. They tell us that 5,000 roof nails were bought, that a carpenter was paid 6d. per day and that it took three workers six days to dig earth for the walls. Sixteen of these rolls have been transcribed and translated over the past three years. They are now being edited and will be published online in the near future, opening the records for public viewing without a need for specialist knowledge of palaeography or medieval Latin.